Most commonly used in cooking, this appetizing oil can infuse your favorite recipes with its aroma and flavor. 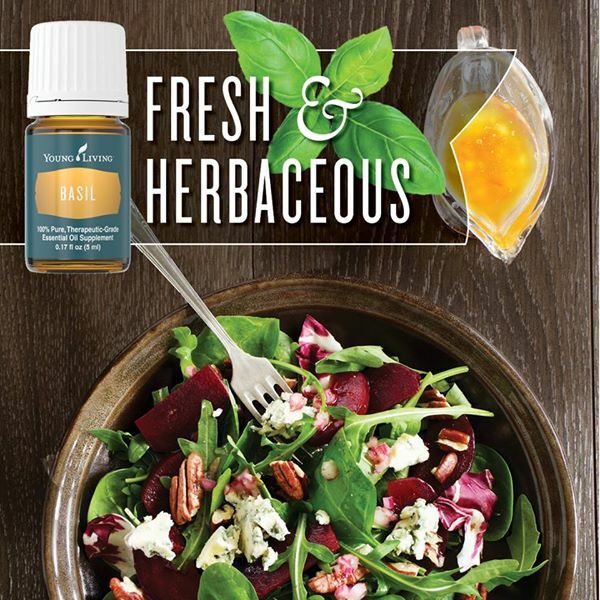 Add a few drops to any dish and experience the benefits of Young Living Therapeutic Grade™ essential oils baked right into your favorite meals. Basil has a strong, spicy aroma that is invigorating. Cooking: Infuse your favorite recipes with the enticing aroma and taste of Basil. Essential oils are VERY potent. Start by dipping a toothpick in your oil and dragging it through your food. Olive Oil: Add various culinary herb essential oils to your olive oil, such as Basil Vitality. Pour over a plate of balsamic vinegar and use foccacia bread for dipping.